It was a packed weekend for Pitt sports, as teams both claimed historic victories and continued prolonged losing streaks. Pitt gymnastics made history setting a new program record, and the men’s and women’s swimming and diving teams claimed decisive victories. Still, men’s basketball continued to struggle in the ACC, while wrestling had a tough start to their conference schedule. The Pitt indoor track and field team took home seven victories Friday at the Youngstown State College Invitational. The Women’s 4×400 relay team set a facility record with a 3:41:20 time. With that time, the team consisting of seniors Morgan Harvey, Quadaisha Newkirk, Laila Ismail and Desiree Garland posted the best mark among ACC schools this season. The Men’s 4×400 relay team also took home a victory with a time of 3:12:81. In addition to these wins, Ismail won the 400m sprint with a time of 55.75 seconds, and sophomore Taylor Middleton posted the top distance in long jump at 5.84m. Sophomore Dante Watson, who was a part of the men’s 4×400 team, also won the 800m. Additionally, Pitt had 10 other top-three finishes. The Panthers will take to the track next when they travel to Clemson, South Carolina, next weekend for the Bob Pollock Invitational. 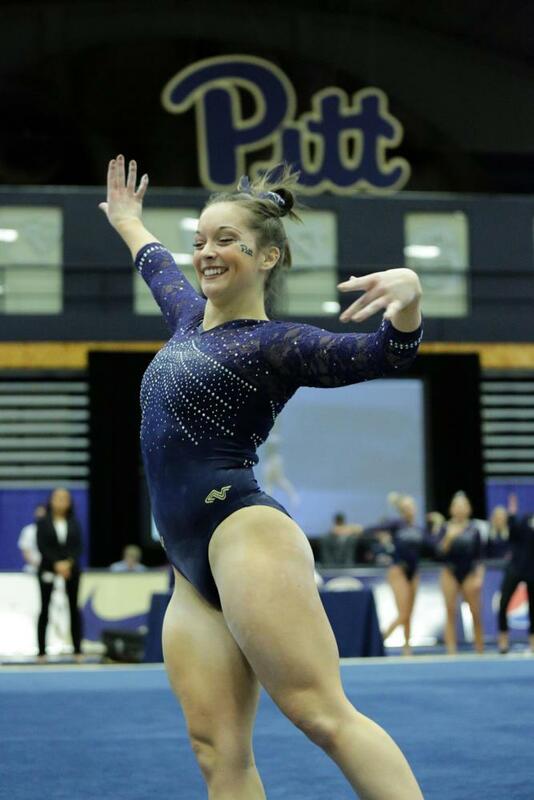 The Pitt gymnastics team broke one program record and tied another in its 196.225 to 195.175 victory over New Hampshire Saturday. The Panthers’ final score was the third-highest score posted in program history, and its best since 2004. The team broke the school record on bars, which had been in place since 1999, posting a score of 49.275. Pitt also tied their record on beam with a 49.125, a score achieved only twice in program history in 2003 and 2004. Individually, first-year Haley Brechwald — who took home the all-around title — won on floor and tied with junior Lucy Brett and senior Catie Conrad for first on bars. Sophomore Alecia Petrikis won the vault event tied for second on bars. Conrad also tied for first on beam. As part of Pitt’s record-setting performance on bars, Brechwald posted a season-high and Brett set her career high, both scoring a 9.875. Pitt heads to East Lansing next Saturday to compete in a quad meet against Michigan State, Eastern Michigan and Rutgers. Pitt wrestling fell to No. 10 Virginia Tech, 31-6, in their ACC opener Sunday at the Fitzgerald Field House. Senior Dom Forys and redshirt senior Ryan Solomon secured Pitt’s two lone individual victories. Junior LJ Bentley put Pitt in an early hole as he was pinned in sudden defeat at 125 pounds. After Forys — who is ranked No. 11 in the country at 133 pounds — defeated No. 14 Dennis Gustafson 4-1, Virginia Tech proceeded to win the next seven matches. Solomon, ranked No. 16, closed out the day on a high note for Pitt with a 2-0 decision over No. 18 Andrew Dunn at 285 pounds. Pitt’s struggles continue as this loss pushes them to 2-7 on the year. They travel to Chapel Hill this Friday to take on another ACC foe in UNC. The Pitt tennis team opened its season with two home wins Saturday, beating Youngstown State and Akron at the Oxford Athletic Club. The Panthers started the day with a 6-1 victory over YSU and defeated Akron by the same score hours later. First-years Claudia Bartolome and Camila Moreno were the highlights of the day, winning both their singles matches against the Penguins and the Zips. Bartolome won 6-4, 6-3 against Youngstown State and 6-1, 6-4 against Akron. Moreno was victorious in her singles match against the Penguins 7-6, 3-6, 10-7 and 6-2, 6-3 against the Zips. Moreno was also paired with senior Callie Frey and together they clinched the doubles point in both matchups. The Panthers opened the day by securing the doubles point against Youngstown State after winning the second and third matches. Junior Natsumi Okamoto gave Pitt a 2-0 lead in singles after winning in straight sets. Junior Gabriela Rezende lost 6-2, 6-3 at No. 1 singles, but the Panthers would win the next four singles matches to secure the overall team victory. The Panthers then moved on to face Akron, where they quickly took the lead by clinching the doubles point. They won the first four singles matches to take the overall team victory. Rezende topped it off for Pittsburgh by earning her first win at No. 1 singles, 6-4, 1-6, 6-2. The Panthers are back in action at home on Friday, Feb. 2, when they host Bowling Green at 1 p.m. The Pitt men’s and women’s swimming and diving teams both defeated Denison Friday night at Trees Pool. With the weekend full of meets for both teams, they agreed to cut most of the race distances in half, turning it into a special sprint meet. The women’s team (10-2) picked up a decisive 204-94 victory while the men (6-3) came out on top 192-101, and Pitt won 28 of 32 overall events. Sophomores Valerie Daigneault, Samy Helmbacher and Shan Hochkeppel all won multiple individual events. Daigneault won the 100 free (51.24) and 100 IM (57.60), Helmbacher was victorious in the 500 free (4:29.59) and 100 IM (51.01) and Hochkeppel took the 50 back (26.66) and the 100 back (56.72). On the diving side, senior Meme Sharp and first-year Noah Marble both won individual titles in the 3-meter and 1-meter. Sophomore Sam Jenkins had a breakout night, finishing second in both men’s diving events with a personal best on the 1-meter (243.38) and the 3-meter (245.85). The Panthers are back in action next weekend in their final home meet of the season as they host the Western Pennsylvania Invitational at Trees Pool. The Invitational begins with diving on Friday at 1 p.m. and finishes Saturday with swimming at 11 a.m.
Pitt men’s basketball suffered a major loss to Duke for the second time in 10 days, this time losing 81-54 on the road and falling to 0-7 in the ACC. The Panthers (8-12 overall, 0-7 ACC) committed 15 turnovers and made just four of their 16 three-point attempts while allowing four Blue Devils (17-2 overall, 5-2 ACC) to score 15 or more points. The result was a game score almost identical to Pitt’s previous match with Duke, in which the Panthers fell 87-52. Pitt’s next chance to break their losing streak — and come up with their first ACC win — will come Wednesday, Jan. 24 when the Panthers host NC State at the Petersen Events Center. In front of a raucous crowd of 13,000 people at the Carrier Dome, the Pitt’s women’s basketball team lost to Syracuse and missed another chance to get an ACC win on the road. The Panthers (9-11 overall, 1-6 ACC) fell to the Orange (15-5 overall, 3-4 ACC) 70-52, despite keeping it close early in the first quarter. Strong 3-point shooting from the Orange kept the Panthers down early and often. Pitt will face No. 5 Notre Dame at the Petersen Events Center this Thursday night at 7 p.m., in the hopes of securing a second conference win.